The Distinct Network Monitor includes a number of general and specific display options to aid you in viewing the portion of your capture that is most useful to you as efficiently as possible. Skipping through packets with errors or warnings is very simple since the Distinct Network Monitor flags all warnings and errors it recognizes. Searching for specific IP addresses or any strings within packets both on a live capture as well as on one that has been stopped. 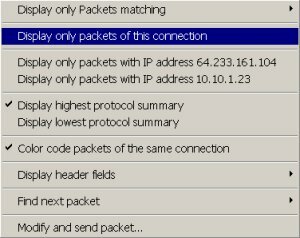 Another convenient way to locate a packet or a group of packets is to create your own IP packet filters.